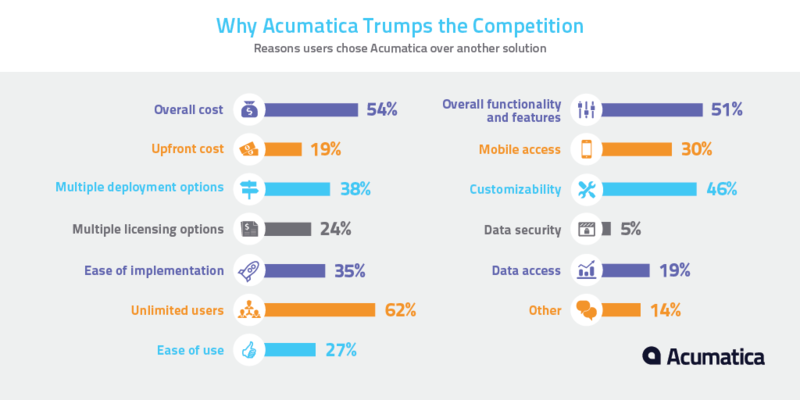 Acumatica is the fastest growing Cloud ERP/CRM solution on the market today; providing a Full Suite of product offerings to address all of your Business Process Needs. Acumatica provides Financial Management, Distribution Management, Customer Management, Project Accounting, Manufacturing Management and Field Services solutions. Acumatica also offers a vast array of 3rd Party ISV (Independent Software Vendor) Solutions to assist you in seamlessly incorporating specific functionality within your ERP/CRM Environment. Do more with less: control workflows and maximize your resources by bringing complete information from everyone, everywhere, in real time under a single pane of glass. One system to manage your entire business, efficiently. Accelerate business performance with automated processes, accurate data collection, financial analyses and forecasting capabilities that drive better business decisions. Read more.. Utilize Acumatica in-house or in a private or public cloud. An attractive deployment and licensing model based off of usage and not per named logged in users, gives you the flexibility and scalability your organization strives for to continue to decrease cost, improve ROI and remain successful with Growth and Scalability in the competitive markets in which we all work today. Users instantly up-and-running on a fully mobile solution; oversee workflows, grant approvals, and log expenses from anywhere; leverage the unique capabilities of your iPhone and Android devices such as the camera or fingerprint reader. Connect to your Acumatica ERP System anytime from any device. Be it Windows, iOS or Android devices. Anytime you have connectivity, rest assured that you will be able to access every bit of data within your system in which you have access privileges-in real time. One view, from any device or PC at any time. Gartner, Inc. is the world’s leading research and advisory company. Gartner publishes proprietary qualitative data analysis and also includes results in their Magic Quadrant Matrix. Nucleus Research provides the ROI, insight, benchmarks, and facts that allow their clients to understand the value of technology and make informed decisions. See what they are saying about Acumatica and their high placement of Acumatica in their ERP Value Matrix 2016. Mint Jutras is an independent research and advisory firm that specializes in analyzing the business impact of enterprise applications. See here what they have to say about Acumatica.